Easington Sports manager Ben Milner knew the value of having a big squad for the run-in. Despite missing six players who were all unavailable, Sports beat Almondsbury 2-1 to stay top of the UHLSport Hellenic League and on course for the Division One West title. Milner said: “It was testament to the players who came in that we got the victory on Saturday. 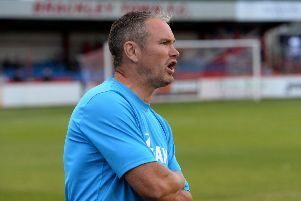 “It was similar to the Letcombe game on the final day last season when we were nervous and had a bad 20-minute spell in which we conceded three goals. On Saturday, we had another poor period but managed to come through it but then conceded a goal. It was massive to get the equaliser before halftime, goals change games to score when we did was so important.